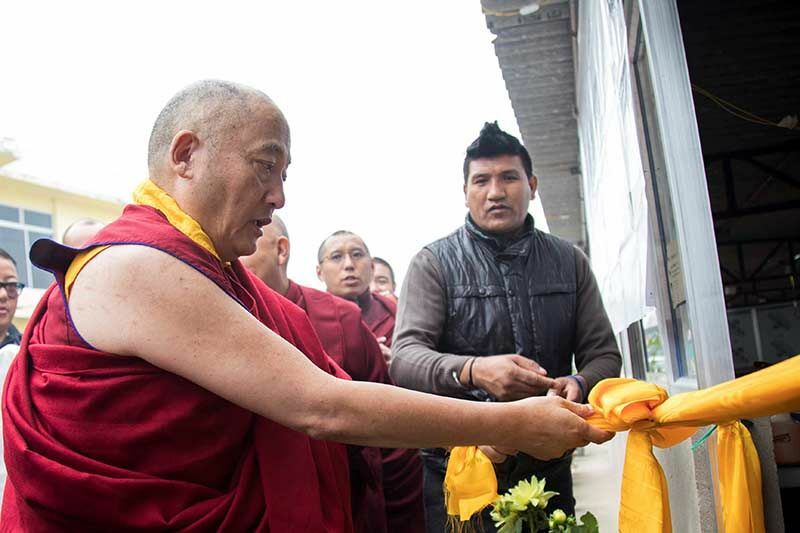 On the first day of the Well-Being Free Medical Camp 2016, sponsored by the Kagyu International Monlam Trust, the Gyalwang Karmapa came to bless the undertaking. Moving through the three rooms of the doctors’ offices, he paused to talk with them and also inspected the pharmacy before walking across the street to the soup kitchen, which especially served the people coming for the clinic. Medical care was offered for four days in Bodh Gaya and also for one day each in three outlying villages. The camp was coordinated by Changchup and Lhakpa Tsering, who started working far ahead of the camp to organize the staff and flow of events. 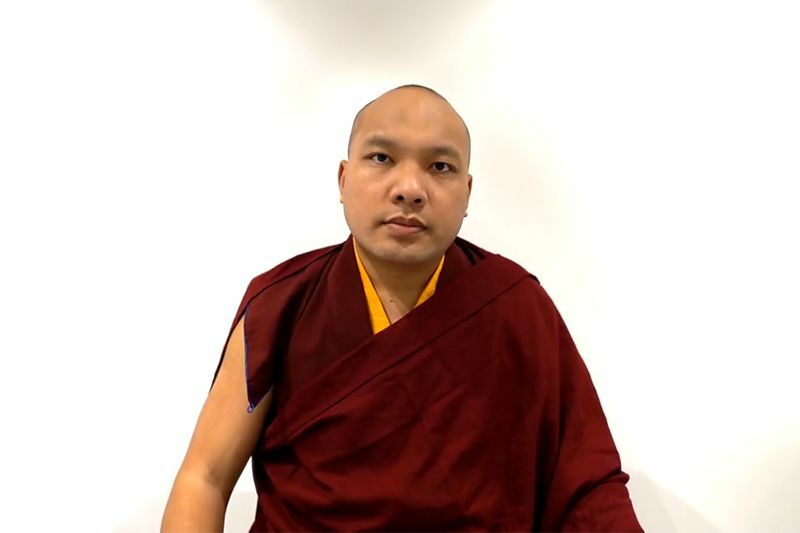 Each year they try to improve the camp, following the Karmapa’s directive: “When we do something for people, we have to do it genuinely as if we are doing it for ourselves.” This year there was a special effort to professionalize the camp: the medicines were branded and top quality, and doctors and nurses were certified professionals. They also had to apply 3 months ahead of time, and the applications were vetted based on the individual’s abilities and motivation. Looking at the needs from the previous year, this year the coordinators newly added in 24/7 emergency care and two physiotherapists. Another aspect of health care that was emphasized this year was the educational component. At four steps along the way, patients are informed about the condition of their basic health and what they need to do to stay healthy. From the long-term perspective, this is perhaps the most important feature of the medical clinics. Serving as allopathic doctors were Dr. Tsundue, a western-trained Tibetan who works at Delek Hospital in Dharamsala, and who also handled the emergency care, and five doctors from Magadh Medical College in nearby Gaya, who understand the local dialect and the special needs of the population. Among the doctors were two gynecologists to serve the female patients. In addition six nurses from Sikkim and six more Tibetan nurses who work in top hospitals in Delhi also came to offer their assistance. 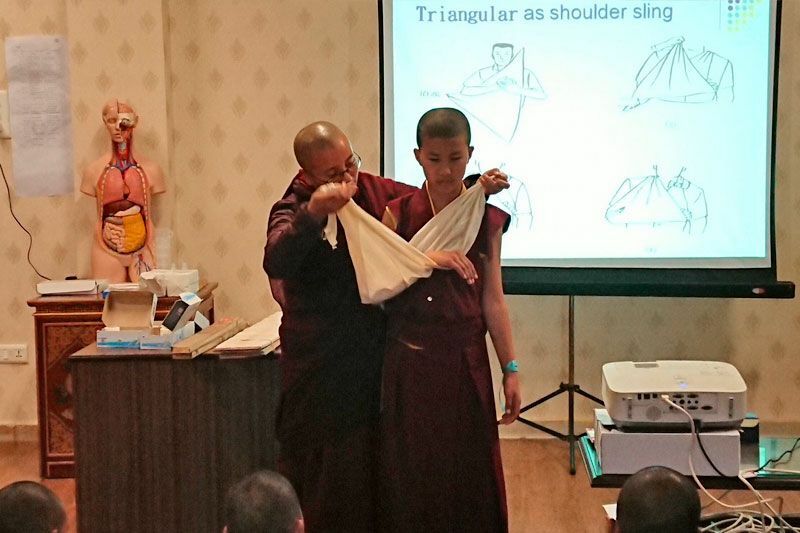 Tibetan medicine was also covered by four doctors who staffed a clinic officially headed by Dr. Dawa. Offering their services were Dr. Namgyal from Norbu Lingka, and Dr. Kalchoe and his wife, Dr. Qusar, who also know acupuncture. This clinic was set up in three tents near the Pavilion where the Monlam takes place. 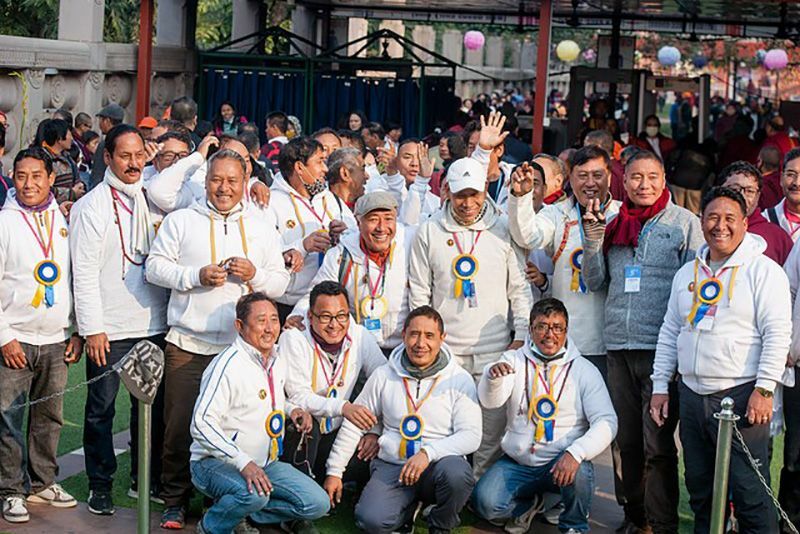 Coming to the Monlam and Bodh Gaya in general are numerous pilgrims from the Himalayan regions of Nepal, Bhutan, Tibet, Arunachal Pradesh, and Ladakh. They turn more to Tibetan medicine, and when they return home, they can continue their treatment, which is important as Tibetan medicine works over time. Over 400 people took advantage of this opportunity each day. The two coordinators further reached out to three local villages of poor people, two of which were return visits. Sometimes it is difficult for the people to afford the bus ride to Bodh Gaya, and so the camp went out to them. The two coordinators visited the new village ahead of time to offer an explanation of the medical camps and asked if they would like them to visit. In an effort to better serve the people’s needs, this year the camp in association with Rokpa Trust is providing a water purifier for a girls’ hostel in the village of Baseri. The girls attend a government school and stay close by since they cannot afford the bus fees to come daily from 10 to 15 kilometers away. The medical camp visited this village last year and the coordinator went to the hostel to determine their needs. Charwaha Vidyalaya is the other village that was a return visit. Here one of the teachers said the students like sports but have no equipment, so this year the medical camp also brought them cricket sets, soccer balls, jumping ropes, badminton rackets, along with notebooks, paper, and pencils. The Monlam Trust is establishing a longer term relationship with these villages in an effort to make a real difference in their lives overall. In brief, the medical camp had a staff of 35 doctors, nurses, and administrative aids, who served over 600 patients a day in Bodh Gaya and the three villages. 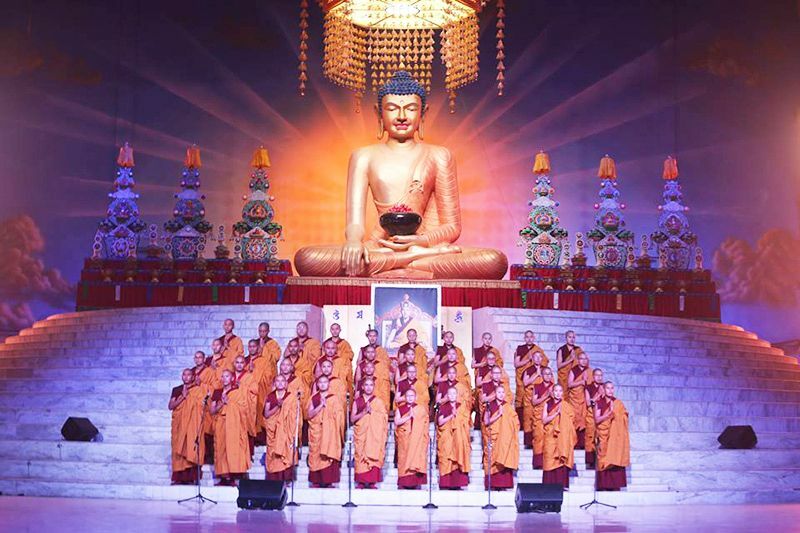 In the future, the Kagyupa International Monlam Trust will continue to develop its care for the local people and also for the pilgrims from all over who come to this most sacred Buddhist site. Continuing in March, a special medical camp will be sponsored by the Karmapa’s Kunkyong Trust, Max Foundation from Delhi, and the prosthetic company, Jaipur Foot (BMVSS) to provide prosthetic devices to the local population of Bodh Gaya. In this way the medical treatment provided by the Karmapa will extend his compassionate care beyond the actual period of the Monlam itself.